Inkfish: Urinating Through Your Mouth Is Great. Ask This Turtle. Urinating Through Your Mouth Is Great. Ask This Turtle. 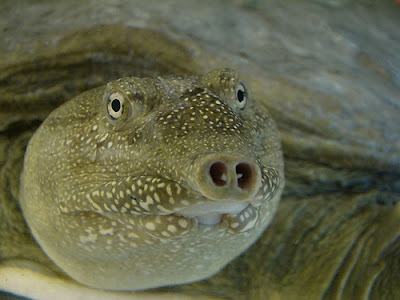 Even if you did ask the Chinese soft-shelled turtle what's so great about excreting bodily waste through one's mouth, you would probably just get gurgling in reply. The animal spends a lot of time with its face underwater. But its unusual strategy may be what allowed it to move into its favorite swamps and ponds in the first place. Pelodiscus sinensis lives in China and other parts of Asia, as well as more remote spots, such as Hawaii, where it was introduced by turtle-soup-eating immigrants. It spends time both out of water and underwater, coming to the surface to breathe air into its lungs. When it has to stay submerged for long stretches, though, the turtle can breathe almost like a fish. It fills its mouth with water and empties it out again while rhythmically pulsing its throat, a maneuver that lets the turtle get all the oxygen it needs via specialized surfaces inside its mouth. Scientists in Singapore observed that a soft-shelled turtle on land will occasionally dunk its head into a puddle for no clear reason. It may stay this way for an hour and a half or more. While in this position, the turtle makes the same throat-pulsing motion, which led the scientists to wonder whether the turtle's specialized underwater-breathing equipment had some other role as well. Yuen Kwong Ip at the National University of Singapore, along with other scientists, investigated organs at the back of P. sinensis's mouth called the buccopharyngeal villiform processes (BVPs, if you prefer). These look sort of like gills and are on the roof and bottom of the mouth, near the throat. To find out exactly what materials were entering and exiting the soft-shelled turtle, the researchers performed a series of tests. They restrained turtles for several days on a dry platform, with a box of water in front of their heads for drinking and whatever else it was they were doing. A second container waited under the turtles' tail ends to collect urine that came out the traditional way. Urinating is a way for animals to dispose of the waste products their cells constantly generate. Nitrogen, one of these waste products, is filtered out of the blood and sent on its way—in P. sinensis and in many other animals, including mammals—as a molecule called urea. It's usually collected by the kidneys and dumped in the urine. But when the researchers observed their soft-shelled turtles' waste production, they found that although some wastes showed up in the urine, most urea came out through the mouth. Ip writes in the Journal of Experimental Biology that turtles on dry land dunked their heads in water for 20 to 100 minutes at a time. While submerged, they repeatedly "rinsed" their mouths with water while rhythmically pulsing their throats. He discovered that this motion simultaneously pulled oxygen out of the water, so the turtles could keep breathing, and expelled urea into it. Looking at the turtle's DNA, the researchers found what looked like a gene for a urea transporter, a protein that carries urea molecules across membranes. The gene was active in the turtle's mouth and the gill-like BVPs, but not—as it would be in humans or almost any other vertebrate animal—in the kidneys. Ip thinks the Chinese soft-shelled turtle's strategy is not, unlike most cases of misplaced urine, an accident. He notes that P. sinensis and other soft-shelled turtles often live in salty marshes and swamps, or even in the sea. If they excreted urea in the usual way, they would need to continuously drink the water around them to make urine. But like human castaways in the ocean, the turtles would be ill-advised to drink this water; their kidneys can't handle that much salt. So instead, P. sinensis—perhaps along with the other soft-shelled turtles—sends urea back toward its mouth after filtering it from its blood. To dispose of the urea, the turtle only has to rinse its mouth with water, not drink it. Chinese soft-shelled turtles aren't the only animals that know the taste of urea. Cows and other ruminant animals excrete some urea into their saliva. Their reasons are quite different: they use nitrogen in urea to feed the friendly bacteria that live in their guts and help them digest plant matter. By swallowing their urea-carrying saliva, cows send it to their stomach and keep their microbes alive. You may find this trick unappealing, but to Ip it's inspirational. Hypothetically, he says, doctors could one day treat patients who have kidney failure by turning on genes for urea excretion in their mouths, just as these genes are turned on in turtles. "Urea excretion can still occur through rinsing the mouth with water, just like the soft-shelled turtle," he says, "without having to go through blood dialysis." Then we'll be able to ask them just how great it is.